This weekend Kirsten and I found ourselves with a Saturday clear of plans and commitments and therefore, as has been the theme of these last few winter/autumn months, we made the decision to find a decent hike somewhere in south-east Queensland to keep us occupied. 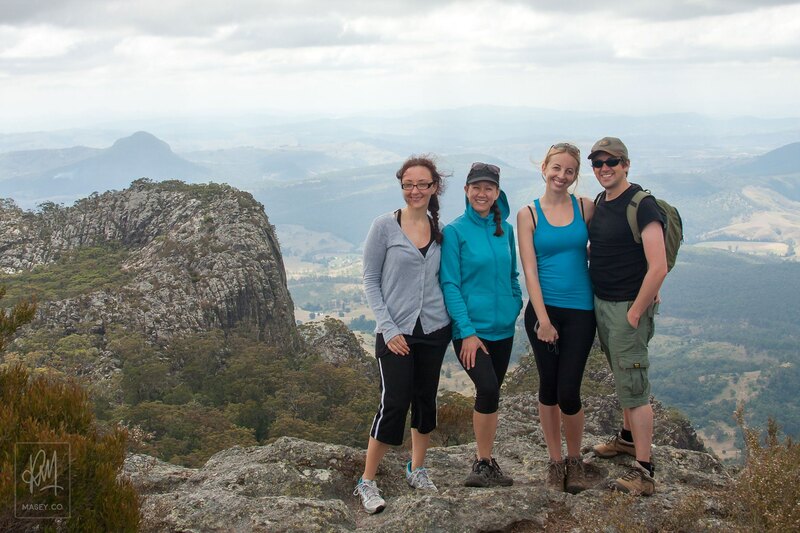 This time around, Kirsten collaborated with Cherie, a work colleague, in choosing the unmarked "Cotswold Track" up Mount Maroon (966m or 3,169ft) as our mission for the day, given that multiple sites on the web regard the 360 degree views from the top as some of the best in south-east Queensland. Joining us on the day's hiking team were Cherie's partner, Kylan, and another of Kirsten's work colleagues, Kassandra. 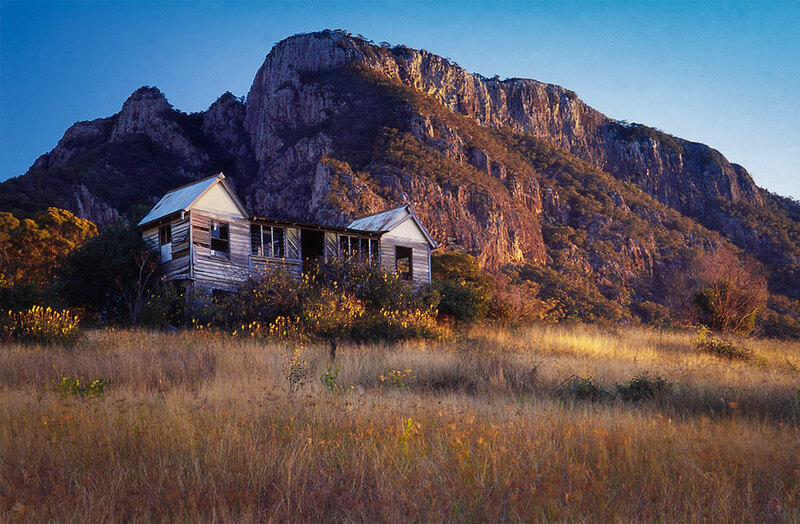 See below for a profile image of Mount Maroon, as depicted by this fantastic sunrise shot taken by Flickr user Paul Dean. Located about 90 minutes south-west of Brisbane, in the Mount Barney National Park, the 2.8km "Cotswold Track" begins at the end of Cotswold Road, a 3.5km good condition dirt strip leading off the Boonah-Rathdowney Road. The trail starts off innocently enough, leading through a small section of private farm land, followed by a ridge-line ascent through eucalypt bushland. However, once reaching Mount Maroon's imposing north-east cliff face, which one can only imagine is VERY popular with local experienced climbers (for more info, search for Ruby of India), you reach a 300m section of gully which provides a relatively steep ascent requiring a fair amount of scrambling. There's no doubt this tough but fun and very scenic section is responsible in part for the trail receiving a Class 5 rating on the Dept. National Parks, Recreation, Sport and Racing website. 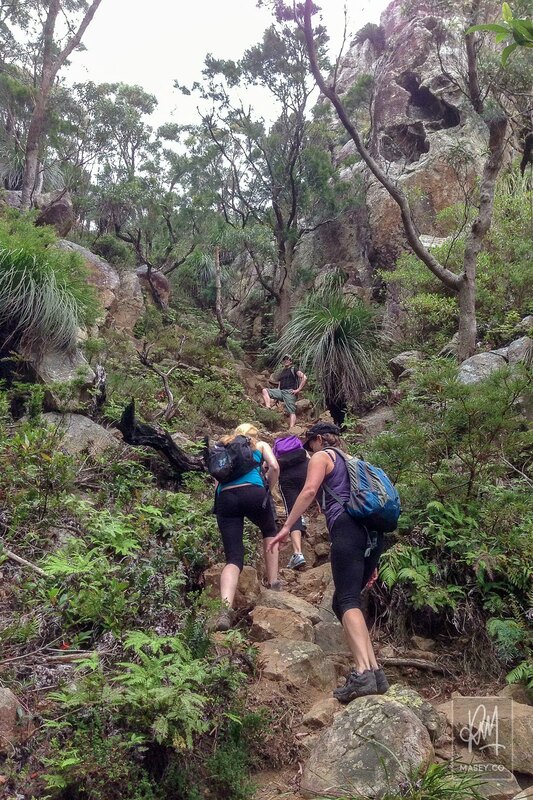 Taking it at a safe, slow pace, we made our way up through the gully which was actually quite beautiful when you took the time to stop and take a look around, littered with boulders, grass trees and various species of wildflowers. 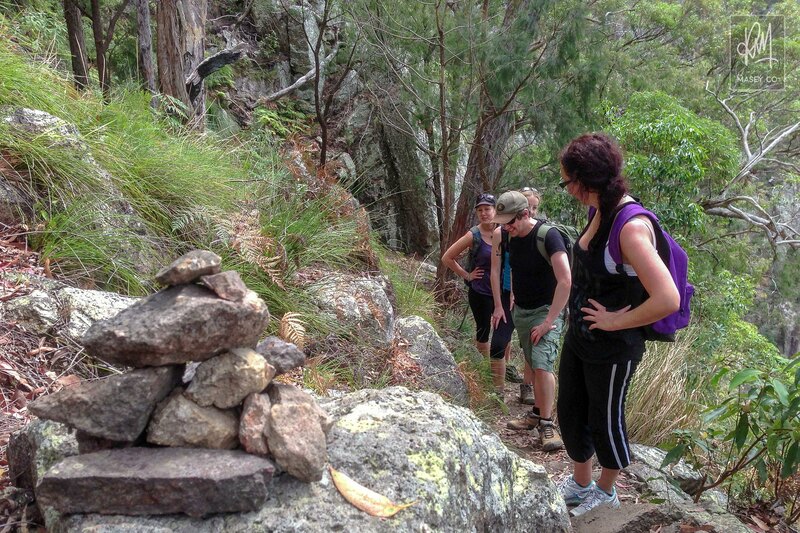 Our group takes a well-earned break along Mount Maroon’s Cotswold Track. One of the steeper incline sections on the trail up Mount Maroon. The panoramic views from the top of Mount Maroon are worth the effort. Given the steepness of the gully and the lack of any real trail markings, short of the odd orange triangle and piles of rocks here and there, it was a pretty satisfying experience making it to the last couple of hundred metres over exposed rock to the summit. It was a happy hiking group once at the top of Mount Maroon. We may not have been blessed with the best of weather conditions in terms of being able to enjoy the 360 panoramic views of the surrounding country under clear blue skies, but what we did get to see was worthy enough to justify the glowing reviews. The following couple of panoramas I shot with my iPhone 5, in opposing directions from the top, give you a bit of an idea as to what you can expect at the end of the "Cotswold Track". 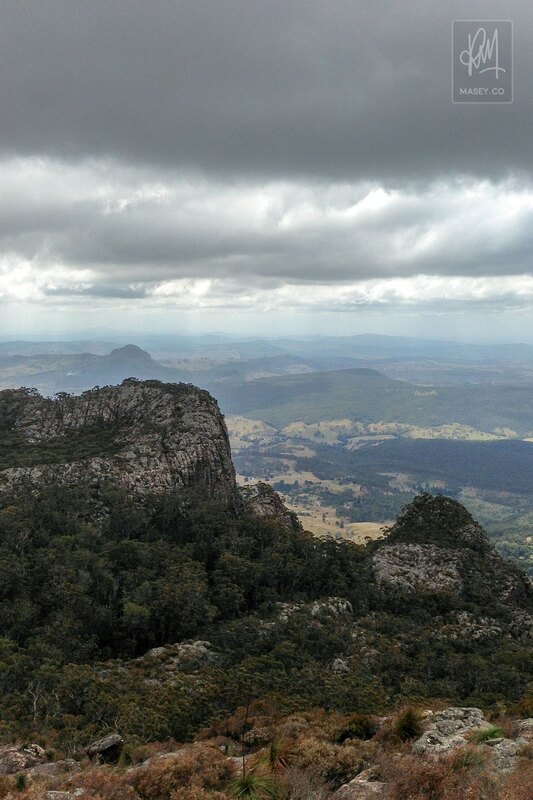 The panoramic views from the top of Mount Maroon are some of the best in South-East Queensland. Given the strength of the wind at the summit, we took a fairly short amount of time to take photos and soak in the views before hiking back down to the top of the gully where a flat, open section of rock served as the perfect spot to enjoy a breather, some lunch and a bit of conversation. From there it was a careful couple of hours spent making our way back down the same way we came up, through the gully and back down the ridge-line to the car park, passing a few other hikers on their way up, along the way. The trail provided a really fun 4-5 hours of adventure which I'd be pretty keen to do again in the future, probably on a winter's day when the cool, clear, blue sky conditions would provide an enhanced viewing experience at the summit. HUGE props must go out to Kassandra who informed us shortly after setting off up the trail, that this was her first ever real mountain hiking experience. Given the grade of the trail and her relative strength/fitness level to the rest of us more experienced hikers, she was an absolute trooper, making it all the way up and then down again without a single objection or negative word. She's now got the taste for a hiking adventure in her system and I doubt it will be long before she drags some more first-timers along with her on her next chosen trail. Congrats Kass!